Looking for fun, new ways to serve salad at your summer picnics this year? Instead of bowls, offer your guests individual Mason jars full of light and summery fare. Mason jars aren’t just for canning and preserving; they can be used in lots of other ways in the kitchen. We’ve all seen Mason jars filled with green salad, layered and ready to be shaken and eaten, but other salads can be put into Mason jars for on-the-go lunches or cute picnic fare. 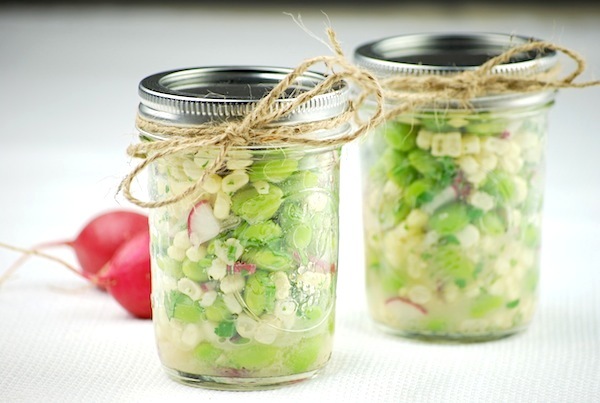 Check out these quick-and-easy recipes for summery salads served in Mason jars. Combine corn, edamame, radishes, green onion and cilantro in a large bowl. In a small bowl, whisk together canola oil, rice vinegar, white miso paste and chili garlic sauce (if using). Stir dressing into corn mixture and divide salad between Mason jars. Refrigerate at least an hour. Shake before serving. In a small bowl, whisk together olive oil, balsamic vinegar and heavy cream. Season to taste with salt and pepper. Reserve. When pasta is done, drain and immediately combine with tomatoes, mozzarella, basil and Parmesan cheese in a large bowl. Pour dressing over pasta and stir to combine. Season with pepper and divide between Mason jars.